GRK FIN/Trim Head Screws are an excellent choice for most fine carpentry applications, as well as window extension jambs and more. GRK FIN/Trim Head screws have the smallest screw head available. Almost all material splitting is prevented because of the Trim Head screw's exceptional small head and the W-cut thread design. Pre-drilling is only necessary if the material's limitations require a pilot hole to be drilled, as in hardwoods like Mahogany. 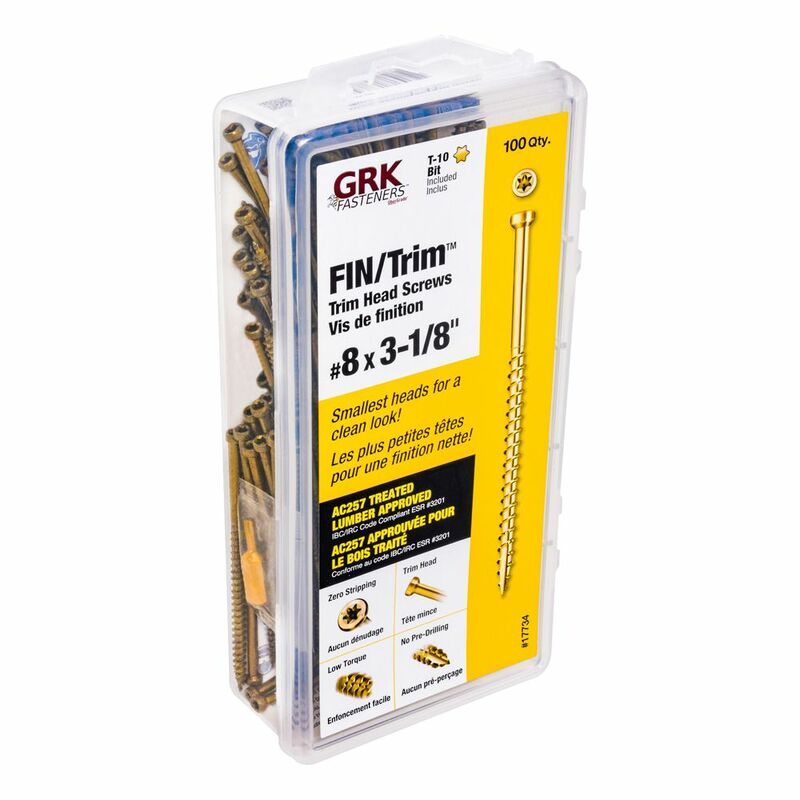 #8 x 3-1/8-inch Star Drive GRK FIN/Trim(TM) Head Screws Climatek(TM) Coated Handy-Pak - 100pcs GRK FIN/Trim Head Screws are an excellent choice for most fine carpentry applications, as well as window extension jambs and more. GRK FIN/Trim Head screws have the smallest screw head available. Almost all material splitting is prevented because of the Trim Head screw's exceptional small head and the W-cut thread design. Pre-drilling is only necessary if the material's limitations require a pilot hole to be drilled, as in hardwoods like Mahogany.